SUDBURY, Mass. — April 2, 2019 ― Yamaha Unified Communications is making it more obtainable to achieve superior collaboration with the CS-700 Video Sound Bar™. Supporting the demand for high-quality audio, video, and collaboration in huddle rooms and small conference rooms, Yamaha continues its updates to the CS-700 by offering a new price point. Designed for huddle rooms, the Yamaha CS-700 Video Sound Collaboration System delivers the highest quality audio, video, and collaboration capabilities in a simple and smart wall-mounted unit that is easy to install and deploy. It features an adaptive beamforming microphone array for perfectly captured conversation; four Yamaha speaker elements to provide the highest degree of audio intelligibility; and a wide-angle HD camera for the far-end participants to see everyone in clear detail. Users can quickly connect to any UC platform via a single USB, eliminating the frustrations and inefficiencies of operating disparate video, audio, and collaboration components. In addition, the CS-700’s integrated network management system allows IT staff to deploy and remotely manage each unit from one location, increasing service response and efficiency. Audio and video conferencing solutions from Yamaha Unified Communications Inc. streamline collaboration and boost productivity wherever people work. Yamaha’s renowned and rigorous approach to development and manufacturing of enterprise-grade microphone systems, conference phones, and video sound bars ensures superior audio quality, reliability, and flexibility. With both wired and wireless options, Yamaha’s unified communications (UC) products enable users to have natural, clear conversations in every meeting space. 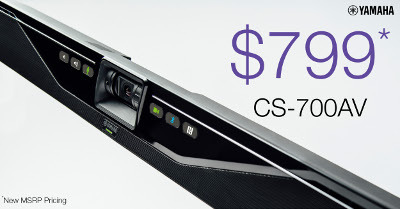 Photo Caption: Yamaha’s CS-700 SIP Video Sound Bar™ available now at a new price point.